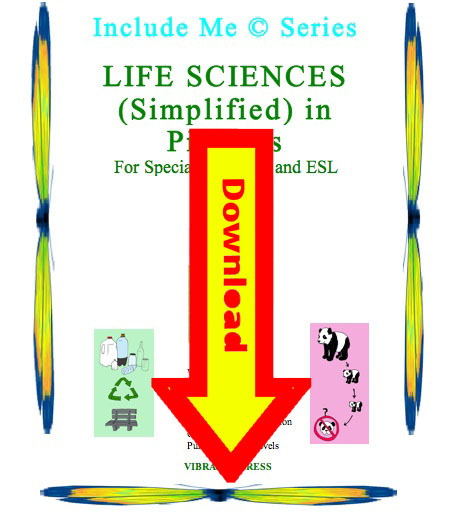 Life Sciences in Pictures for Special Ed., ELL and ESL Students from the Include Me © Series (Teacher's Resource Book for Differentiated Instruction, Special Education and ELLs) by Lonnie Dai Zovi is a picture based, simple, and leveled, packet to differentiate instruction. With your good teaching, and with these worksheets to teach both the concepts, vocabulary and facts of simple living things all students will develop English language skills as they learn. Often students with varying degrees of English abilities are dying to do what the rest of the students are doing, but they find the vocabulary beyond their reach. At the same time, some of the ESL or ELL may have limited basic or prior knowledge of the concepts being taught so the pictures help in this way, too. The visual learners, slower learners and special education students can benefit by this approach as well as the ESL and ELL students. The included suggestions for peer tutoring will see the whole class included in all the students' learning. This will work well for large classes with learning centers, as well as a pull out situation. Or, if you are the demonstration/lecture/reading type teacher, when it comes to reinforcement and assessment, these sheets will also work well. The reading and exercise levels vary from 2 - 3.5 (although the content is covered in 5th grades and higher). It is suggested that these be used when the on - level or nearly on level student do the textbook readings and activities. This is NOT a substitute for the regular textbook or curriculum, but a resource of ready - made readings and activities that students of all levels can learn from. All students should be, and now can be, included.